Back in July, Honda Malaysia previewed the HR-V facelift, showing the car in its new RS variant guise, albeit with the interior blackened out. The SUV still hasn’t been officially launched, but the interior has finally been revealed. Exterior-wise, the facelift introduces a new front end, led by a revised grille, new reflector-type full-LED headlamps, a reprofiled bumper and LED fog lamps. At the back, there’s a new horizontal chrome link strip on the tailgate, and the tube-type LED tail lights finally make their debut here. The RS, which is the display model at KLIMS 18, adds on darkened contrast elements such as dark chrome door handles, a black chrome license garnish and gloss black side sills. The variant, which rides on 18-inch two-tone five-spoke wheels and 225/50 profile rubbers, also gets a new exterior colour called Passion Red Pearl. According to the company, the shade will be available across the model range and not just limited to the RS. The interior reveals reshaped front seats and a two-tone cabin, a mix of a light shade called ivory and dark grey – the dashboard and centre console contrasts are done in the same fashion as the Japanese model, but the seats in the local version are in a single colour, in this case, ivory. The kit list includes paddle shifters, an eight-way powered driver’s seat and aluminium sports pedals. For the facelift, all versions of the HR-V will come equipped with a reverse camera, which also means the inclusion of a touchscreen infotainment system as standard across the range. There’s a new Variable Gear Ratio (VGR) steering system, which is only available on the RS. Otherwise, it’s status quo mechaniclally – the familiar 1.8 litre SOHC i-VTEC engine and CVT ‘box combination is unchanged, as is its 142 PS and 172 Nm output. Safety-wise, the HR-V now gets six airbags as standard across the model range, and there’s also emergency stop signal (ESS), vehicle stability assist (VSA) and hill start assist (HSA). The RS also features a Honda LaneWatch blind spot camera, but will not come with City Brake Active System (CTBA) autonomous emergency braking. Much improved but still behind segment leader. But the segment leader is HRV. Interior design is still ugly,outdated and low grade compared to its rivals BUT in Malaysia: Its a Honda ma b****, buy it now! Absolutely disgusting. Where’s the Apple CarPlay, Android Auto, automatic emergency braking etc of overseas models? Honda must love south east Asia – they can sell any model there and the locals will lap it up because it’s a Honda. Thats some ugly interior boss. Which moron decided that interior colour scheme? Feel like so kosong. Just compare the spare tyre compartment with proton x70. X70 is fully covered. No wonder people will compaint the sound prove is so bad at honda car. Interior is very ugly and outdated Absolutely correct. 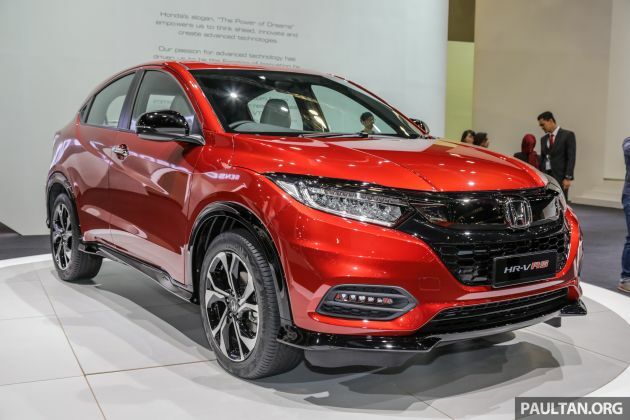 Honda Malaysia where is the black alcantara with red stitching? Malaysian consumers are want to see more than just boring leather in special sport edition cars. HRV leather wrap interior actually got better interior than CHR which mostly hard plactic. But why lah change color to beige, at least dark grey lah. Proton X70 looks a better buy if compared with price range and specs although it’s a different segment. But mostly will buy this HRV anyway because most buy the brand not the specs. How much? Till today HM still cannot decide on it pricing?